16GB DDR3 RAM. NO SOFTWARE. i.e. between 9.30AM-10.30AM. Key Features. The purposeful design of the PowerEdge R410 provides reduced complexity, showcasing clutter-free cable routing for more efficient airflow and easier maintenance. An LCD screen positioned on the front provides aisle level access to deploy the server. DELL PowerEdge R410 2 x X5650 2.66Ghz 32GB DDR3 Ram 300GB 10K HDD 3.5" VMware. DELL PowerEdge R410. The Dell™ PowerEdge™ R410 was developed with a purposeful design—energy-optimized technology. 1 x 300GB 10K Enterprise Disk. DELL PowerEdge R410... Xeon e5620, 8gb ram. , 80gb hdd Windows 10 enterprise installed Condition is Used. Perc 6i Raid. Dell Poweredge R410 - E07S 2 x Quad Core Server. Dell N051F Motherboard. This is for both our protection and yours. Everything is fully tested unless otherwise stated. 1 x SAS PERC H200. Dell R410 spec. 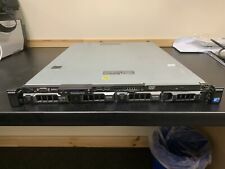 1x Dell R410 1U 4LFF Rack Server. Grab yourself a bargain! 2x Heatsinks. Fibre/SCSI HBA Cards. 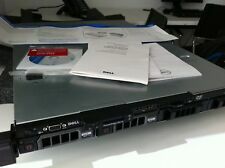 Buy it now 1 complete set of dell r410. with rail kit. We will resolve the problem directly with you. Dell PowerEdge R410 2x Xeon X5675 3.06GHZ Six Core 12GB DDR3, (2 TB - HDD) 3.5"
2 x Xeon X5675 3.06Ghz. 2 x Xeon X5675 3.06Ghz. Write to us. Convenient Prepaid Labels and Collection Service. 1 x 300GB 10K Enterprise Disk. Alternatively, you can collect the parcel from your local depot. The purposeful design of the Dell PowerEdge R410 provides channeled internal cabling for efficient airflow and easy maintenance. An LCD screen positioned by the front of the bezel provides aisle-level access to monitor and maintain. Model PowerEdge R410. Product Line PowerEdge. Ram Amount 16GB. Disk Space No HDD. Ram Type DDR3 SDRAM ECC. System has been fully tested. No hard drives are installed. Hard drive caddies are missing. 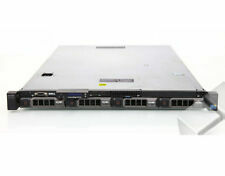 Available for sale is a Dell Poweredge R410 1U Rackmount Server (1x Xeon E5649 / 12GB / No HDD) 4912. This item is tested and working, and has been reset to factory defaults. No rails included. Other Information. Dell PowerEdge M710. Dell PowerEdge R410. Dell PowerEdge R610. Dell PowerEdge R710. Dell PowerEdge T310. Dell PowerEdge T410. Dell PowerEdge T610. Dell PowerEdge T710. HDD Capacity 4 x 3.5" SAS HDDs (3 Caddies Included). Included in sale are 3 x 3.5" HDD Caddies. All hard drives are fully tested by performing a HMG Infosec Level 5 wipe on them. Everything is fully tested unless otherwise stated. Dell Poweredge R410. DELL Poweredge Servers. Dell Poweredge 2850. Dell Poweredge 1950. Dell Poweredge 2900. Dell Poweredge 2950. Dell Poweredge R200. Dell Poweredge R510. MODEL NUMBER R410. HDD 2 x 1TB RAID 0. PRODUCT LINE PowerEdge. MANUFACTURER Dell. OPTICAL DRIVE DVD-RW. Rapid IT's highly trained staff each have their designated area of expertise, so should you need advice or assistance you know you'll be getting the best possible help. DELL PowerEdge R410 2 x X5675 3.06Ghz 32GB DDR3 Ram 300GB 10K HDD 3.5" VMware. 2 x Xeon X5675 3.06Ghz. DELL PowerEdge R410. 1 x 300GB 10K Enterprise Disk. Perc 6i 256mb & Battery. 32Gb ( 8 x 4GB ). Convenient Prepaid Labels and Collection Service. Dell Poweredge R410. 24GB DDR3 Installed ( 32GB, 48GB, 64GB, 96GB & 128GB Available ). DELL Poweredge Servers. Dell Poweredge 2850. Dell Poweredge 1950. Dell Poweredge 2900. Dell Poweredge 2950. Dell Poweredge R200. Dell Poweredge R410. Dell PERC H700 RAID Card. DELL Poweredge Servers. Dell Poweredge 2850. Dell Poweredge 1950. Dell Poweredge 2900. Dell Poweredge 2950. Dell Poweredge R200. Dell Poweredge R410. DELL Poweredge Servers. Dell Poweredge 1950. Dell Poweredge 2950. Dell Poweredge R510. Dell Poweredge R610. Dell Poweredge R710. Dell Poweredge R810. Dell PowerEdge R410 1U Rack Server. 16GB (4x4GB) DDR3 RAM. Dell Servers HP Servers Hard Drives Powervault Arrays Equallogic Storage Networking Tape Drives. an ETB 12 Month Warranty. This does not affect your statutory rights. Dell PowerEdge R410 2x Xeon X5675 3.06GHZ Six Core 128GB DDR3 2TB SAS HDD 3.5"
Dell PowerEdge R410 Rackmount Server. DVD-ROM Optical Drive. 149155 P 9845 RDY. DELL PowerEdge R410 2 x X5650 2.66Ghz 32GB DDR3 Ram 300GB 15K SAS 3.5" VMware. DELL PowerEdge R410. The Dell™ PowerEdge™ R410 was developed with a purposeful design—energy-optimized technology. Perc H700 512mb & Battery Front Bezel : NONE. Dell PowerEdge R410 Rackmount Server. 2 x 146GB 15K SAS hard drives.